Pass what on? Some of the abundance you have going on in your life. I think this week calls for Things To Do In Miami that involve giving back to the community and those less fortunate. You may even enjoy yourself while doing it and keep it up. 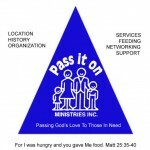 Pass It On Ministries has been helping the hungry in South Florida since 1985. It should be noted that over half of those helped are children. There’s something wrong with someone going to bed hungry when there is so much to go around. When it’s a child, even more so. And they don’t just give the man a fish, they hook him up with a fishing rod for the future. So contact them and drop off some non-perishables. And if things are tight right now, give them your time. All of their foods are collected, sorted and distributed by volunteers. This entry was posted on Monday, March 29th, 2010 at 7:39 am	and is filed under 365 Things To Do In Miami. You can follow any responses to this entry through the RSS 2.0 feed. Both comments and pings are currently closed.